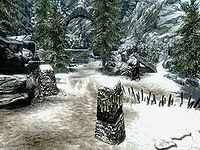 Deepwood Redoubt is a Nordic ruin west of Solitude and far northeast of Markarth containing Forsworn. It has an exterior and two zones, Deepwood Redoubt and Deepwood Vale. It serves as the entrance to Hag's End—and is the only way to discover those locations—forming a sizable dungeon network. The House of Horrors: Help Molag Bal take revenge upon a servant of Boethiah. As you approach from the stairs to the north there is a snowberry bush on your right. You will find yourself in front of a fortified position, with three Forsworn guarding the top of the staircase: two archers and one melee fighter. Once you've taken care of them, at the top of the staircase is a campfire on your left and a door set into the mountainside that leads into the actual interior of the dungeon. There is a second snowberry bush to the left of the entrance. Before venturing in, past the entrance and to the west are some stairs where another Forsworn is standing over an altar. The altar holds an iron battleaxe, some hagraven feathers, a filled random soul gem, a potion of minor magicka, and a random poison. On your way back from the altar you will find a lean-to with a random battleaxe, a long bow, an iron helmet, a potion of minor healing and a potion of minor stamina. Through the iron door you will enter a frozen burial chamber. As you enter, on the right, a burial urn, a random dagger, and three gold coins are tucked into a bottom burial compartment. Up ahead you will see a closed iron gate. Just before the gate, on the right, is a chest rigged with an apprentice level tension cable that triggers a spear trap from out of the wall below. Opposite this is a dead draugr in a lower alcove with a random helmet in the alcove above. The gate opens to more catacombs, with another random helmet on the left before the path turns to the southwest. Just before you reach the stairs, watch out for a pressure plate in the middle of the path that activates a poison dart trap. Climb to the top of an icy staircase to reach a large cavern. 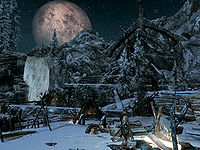 To the left is a campfire with two Forsworn standing beside it, one of which is an archer and the other a melee fighter. Attacking these two will alert two additional Forsworn archers into the caged walkway above. Once all of these are dealt with, go back to the top of the stairs. To the right of the stairs, climb the rocks on the north wall. At the top is a dead adventurer with a medium coin purse and a random potion. An apprentice-locked chest is half-buried in the snow. Head back toward the campfire, not forgetting to loot the Forsworn killed there. There is only a skeleton with a small amount of gold and a random dagger in the area under the caged walkway. Beyond the campfire a Forsworn archer is at the end of a corridor of swinging blades. The lever to shut off the blades is also at the far end of the corridor. Before this trapped corridor there is an alcove on the left with a food sack, a pheasant hanging from a rack above and a random war axe, with a burial urn in the top of an unlit brazier also on the left just before the corridor. Once past the archer and the swinging blades, pick up the coin purse, a sample of hagraven feathers, and a steel mace from the table on the left as you pass. A steel shield is also by the table. 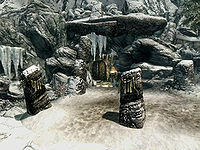 Before entering the next room there are three frost runes on the floor (see bugs); one in front of you, one on the right next to a stone table, and the other next to the wall by the doorway in the southern corner. 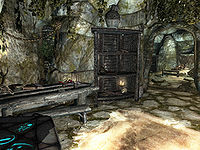 Among the rubble in front of the entrance there is a partially covered burial urn, on the table is an empty soul gem and another sample of hagraven feathers, and a random potion is on the sideboard next to the table. The doors to the east are master-locked, but can be opened using the Deepwood Redoubt key or your lockpicking skill. 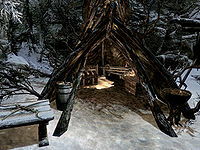 To locate the key, go through the doorway to the south being careful to avoid the two bone chimes, as any noise from them will alert a sleeping magic-using Forsworn. Just inside the room, a Deepwood Redoubt key and a random magicka potion are on a shelf (unless you have triggered the frost runes, in which case the key and potion will have been blown across the room). An arcane enchanter is against the wall to the east. 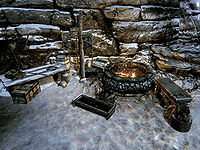 Next to it is a table with a Forsworn Missive, a random war axe, two sprigs of snowberries, and a couple of common books on top. In the room where the Forsworn magic-user was sleeping, there is a lootable draugr corpse partially hidden behind the bookshelf on the left side of the room. After dealing with the sleeping Forsworn, loot the Deepwood Redoubt key if you did not find it in the first room. 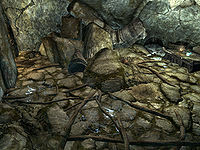 A couple of common books can be found on the bookcase, with a lootable dead draugr in an alcove behind the shelves. There are also a pair of leather boots to the left of the shelves. Open the master-locked doors in the main room. The doors open into a short damaged corridor with a cave-in at the other end. There is a random sword stuck into the rubble up to the hilt. The door onward is to the left; be wary of the pressure plate that activates a spike wall on the threshold. Avoid the plate and climb the path, opening the doors to reach the caged walkway previously seen from below. Here you will encounter archers if you didn't kill them previously. At the far end of the walkway the path continues to the northeast to a Forsworn melee fighter sitting at a table in front of you facing away. At the bottom of the stairs, on the right is a medium coin purse, while at the top of the stairs, also on the right, is a set of shelves holding a random potion. To the left is a random pair of boots. The iron door is unlocked and leads to Deepwood Vale. To the left of the door is a burial urn, while to the right are two barrels, one of which contains ingredients. 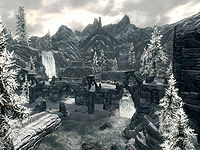 Not really a conventional zone, Deepwood Vale is actually a large exterior zone within Deepwood Redoubt, enclosed from the outer world by the fierce mountains of the Reach. You exit into a snowy area with trees all around and a path heading to the southeast before turning to the east. Here the path passes under a rock arch formation, with a snowberry bush on your right. In front of you is your first look at the large fortress ahead. You can see a large arch ahead with stairs leading up to a lookout point; towers are to the north and south, with the structure rising in the distance. Follow the path as it twists and turns to reach a fast moving river. Follow the river downstream to a dead frost troll, a nirnroot, and an apprentice-locked chest. Head back upstream to the bridge across the river. Just before you cross the bridge there is a corundum ore vein to your left. Notice two archer Forsworn patrolling from the two lookout points ahead. Cross the bridge and up two flights of stairs. At the top of the second flight of stairs is the large Forsworn camp, spread out over three sections. Forsworn are warming themselves by a large campfire just in front of you, and many other Forsworn are busying themselves around the camp. The first tent by the fire has a potion of random healing on the table. A pair of random bracers or gauntlets are on the table outside the tent. To the left are three more tents and a tanning rack. A Forsworn is sitting at a table and another is wandering the area. The first tent has an empty petty soul gem and a random poison; there is nothing of interest in the remaining tents. Across from here is a smithing area with a workbench, a forge and anvil, and a grindstone. The tent here has a medium coin purse, a random set of armor, and some weaponry. There is an unlocked chest under the table. To the south of the smithy are five more tents arranged around a campfire. There are two Forsworn here; one sitting in the tent to the right, and another asleep in the second tent on the left. An alchemy lab is in the first tent on the left, as well as a set of shelves containing a potion of minor stamina, a random poison, a canis root, and an apothecary's satchel. A copy of the Sneak skill book Sacred Witness is found on the table. The stairs in the southeast corner of this area lead up to the Forsworn Briarheart. The wooden steps in the west corner lead up to the south tower. Take the wooden steps to the west first. There is a Forsworn sitting on a bench to your right and the tower is just ahead. There is only an ice wolf pelt and two samples of frost mirriam in this section of the tower, so descend the stairs to the left of the tower to the lower level. In the tower's lower level is a grindstone and a weapons rack containing an iron sword, an iron mace, and a random warhammer. There are also stairs leading down to your right as you enter. Down these stairs is a table with two healing potions. There is also a master-locked wooden door that opens to the outside. From this tower, follow the bridge north to the lookouts. First you will come to a Forsworn chopping wood at a wood chopping block. There is a campfire with a cooking pot and a rack with two hanging salmon. The next bridge continues along the wall to a patrolling archer and a Forsworn mage sitting at the table. Notice the stairs heading down into the water. Swim towards the bridge the camp is on. Take a quick dunk underwater to find an apprentice-locked chest. Continue across to the north tower. Outside the tower, under the hanging cage are three barrels with an iron battleaxe on top. Inside the tower is a Forsworn melee fighter standing by a long table whose back may be turned to you. There is nothing of interest on the first level, so take the stairs up. Here a long table holds a random mace, a random empty soul gem, and a random potion of healing. You can jump over a large hole on the floor to the north, but there is nothing of interest there. From here take the wooden ramp to the southeast, back across the river and through the three Forsworn tents. Veer left, under a stone rampart, to a small set of wooden steps leading up to the Forsworn Briarheart. There is a second Forsworn here as well, standing in front of three archery targets. The Briarheart is often watching him while seated on a bench. From the wooden steps, you will be approaching the Briarheart from behind. Straight ahead is a tent containing the boss chest. Inside the tent is also a random battleaxe, a copy of The Legend of Red Eagle, a leveled healing potion, and another potion. There is a steel shield next to the table. To the right of the tent are stairs leading down to the Forsworn camp. Take the stairs heading up to the northeast to discover Hag's End. When entering Hag's End the path turns to the northwest and continues along until you get to another lit brazier. There are stairs leading up to the east and at the top of the stairs, close to the stakes, the door leading to Hag's End. From here you can climb up on top of the waterfall where there is an expert-locked chest with the Predator's Grace boots next to it. There is also a quicksilver ore vein (see bugs) among some rocks across from the chest. It is possible from this height to Whirlwind Shout across to the altar on top of Hag's End. Head through the unlocked iron door to enter Hag's End. Deepwood Vale does not exist within the regular worldspace. 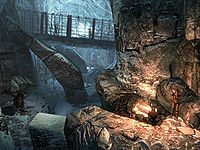 Although it is possible to fast travel from this location, it is not possible to reach by means other than passing through Deepwood Redoubt or Hag's End. If one uses the console command TCL, one can see that this vale is surrounded by an undetailed, unpopulated worldspace. Oddly, the Forsworn of Deepwood Vale are likely to flee from combat despite taking little to no damage. Only the third of the frost runes, near the room in the southern corner may respawn. ? You may not be able to interact with the quicksilver ore vein. ? Entering and exiting Hag's End may solve this issue. Level of Detail issues may cause portions of the mountains surrounding the vale to not render any textures if viewed from the lowest points in the vale. As a result, they will appear black. ? It is possible to get stuck in the alcove with the pheasant hanging in it, but a combination of crouching, turning sideways and jumping makes it possible to free yourself. ? This page was last modified on 18 April 2019, at 16:13.